Not what I expected from Nick Bland and Freya Blackwood. The runaway hug is an extremely cute book about a girl who is given her mother’s very last hug. Nick Bland of The very cranky bear franchise usually writes funny rhyming stories about bears. In this book he has teamed up with Freya Blackwood of the North Fitzroy bob, layered garments and striped tights fame who normally illustrates books about girls with bobs, layered clothing and stripey tights. The reason that this is such a surprise as a book is that this book falls squarely into the category of the latter. As a result, the book has a very different sense of humour than expected. Obviously the idea that a hug can run out is a very funny one and obviously the earnestness with which the girl undertakes her role as custodian of the last hug is also very funny. The illustrations are funny too. There is a scene where the dad just throws his hands up in the air in celebration of the hug he has just received (ok, he is probably gesturing at the TV but it is funny to imagine that it is about the hug). But overall it is nowhere near as funny as The very cranky bear. The illustrations themselves are totally awesome. Blackwood has an ability to zoom and pan and show texture and warmth and the love that is in this chaotic family home. She encapsulates the bedtime ritual and emotionally purveys the devastation of losing the hug. She also plays off the incompleteness of her drawing, all guide lines and first and second attempts, aqainst a minute level of detail evident in the carefully selected contextual articles that give the book its authenticity (the peg ears on the toy zebra, for example). The runaway hug is a book that says, ‘Watch out, kids sometimes take things too literally!’ It does so in a beautiful and mildly comical manner. Readers who expect something more bazaar or droll will be disappointed but those looking for a sweet little story about hugs and family will be well rewarded. I agree with your views. Great analysis. 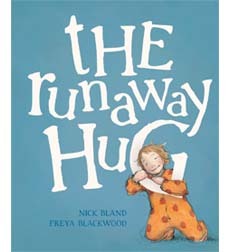 Pingback: The Runaway Hug | Review | CBCA BotY 2012 | Tim the Librarian | Love to read, love to learn!